American, Contemporary. 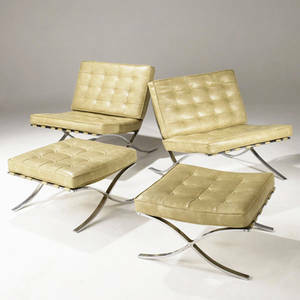 Pair of designer E.J. 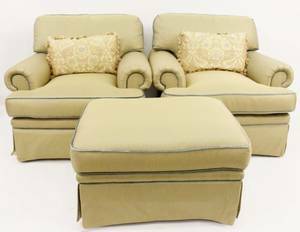 Victor upholstered club chairs with sage green and sand colored gold striped fabric throughout. Upholstery with light blue trim. 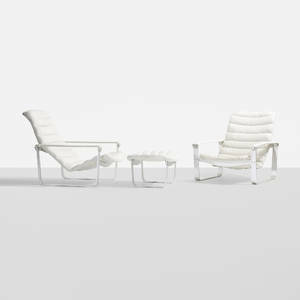 Arm chairs with rounded arm rests and rectangular backs. 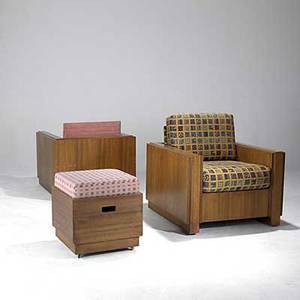 Chairs accompanied with rectangular fabric upholstered ottoman with matching fabric. Black labels for manufacturer on seat underneath cushion. Each chair with rectangular tasseled throw pillow in champagne color with blue accents on flowers. 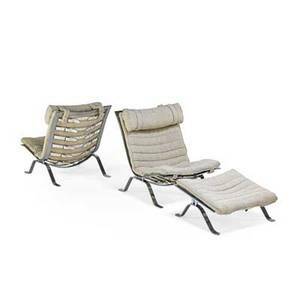 Arm chair height 32.75", width 38.5", depth 37.5". T.h. 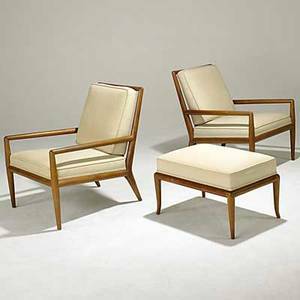 robsjohn-gibbings; widdicomb; pair of walnut lounge chairs with ottoman; unmarked; chair: 31" x 26" x 33", ottoman: 16 1/2" x 26 1/2" x 18"
Arne norell (1917 - 1971); norell; pair of ari lounge chairs and ottoman, sweden, 1960s; chromed steel, wool, leather strapping; unmarked; chair: 31 1/2" x 26" x 38", ottoman: 14" x 26" x 26"
Style of mies van der rohe pair of barcelona lounge chairs with cream tufted leatherette cushions over chrome bases, each with ottoman. 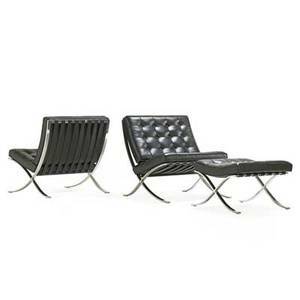 chair: 31" x 31" x 33"; ottoman: 14 1/2" x 24" x 24"." 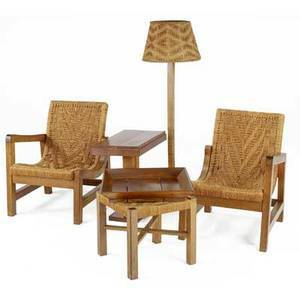 Contemporary furniture pair of bamboo club chairs with matching single ottoman together with a wicker armchair with matching ottoman. 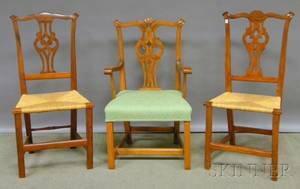 bamboo chair: 33" x 30" x 29"
Style of frank lloyd wright; pair of mahogany club chairs and ottoman; missing one back cushion; 36" x 34" x 36"
Country Chippendale Carved and Upholstered Maple Armchair and a Pair of Maple Side Chairs with Woven Rush Seats.